Today marks the anniversary of the December 26, 1776, Battle of Trenton, a major victory for George Washington and the Continental Army over the Hessian garrison stationed in New Jersey. 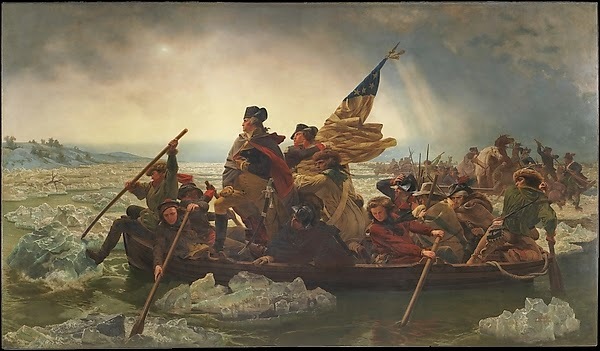 On Christmas Day, Washington and his troops had crossed the Delaware River, an event commemorated in one of the greatest American history paintings, "Washington Crossing the Delaware," by Emanuel Leutze, which hangs in the American wing at the Metropolitan Museum of Art. Leutze actually painted the picture twice. He began painting the scene in 1849, but the canvas was damaged in a studio fire. He then set the original aside and started work on this image. (The first version was ultimately completed, but was bombed out of existence during World War II.) Leutze, who immigrated to New York and lived at the Tenth Street Studio in Greenwich Village, hoped to get work from the U.S. government painting patriotic scenes, so he paid to have "Washington Crossing the Delaware" exhibited at Stuyvesant Hall on Broadway between Bleecker and Bond Streets. The painting was an immediate hit--according to some sources, over 50,000 people paid to come see it--and while the United States Congress was interested in acquiring the canvas, it ultimately went to a private buyer who paid $10,000 for it, an almost unheard of sum for a contemporary painting at the time. Note the flag-bearer behind Washington: that's James Monroe, America's fifth president, who was a member of Washington's campaign. Yesterday, thousands turned out for the annual reenactment of the crossing. There won't be a Postcard Thursday this week because (ICYMI) this Thursday is Christmas. Merry Christmas to those who celebrate the holiday, and to everyone we hope you've had a wonderful 2014 and are looking forward to a great 2015. 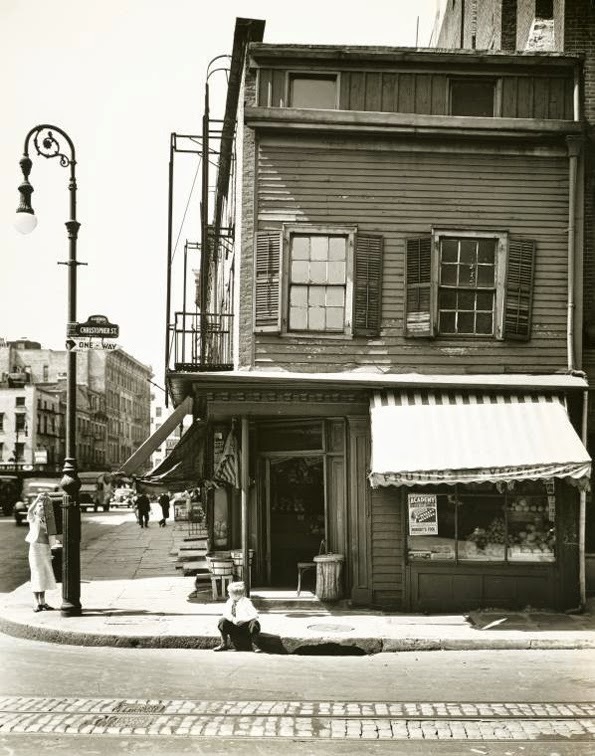 James wrote a piece on the evolution of Bleecker Street (and, by extension, Greenwich Village) that was published a few days ago on Curbed. To read the story, follow this link. Some of the photos he researched for the story didn't make it into the final piece, so we've included them below. 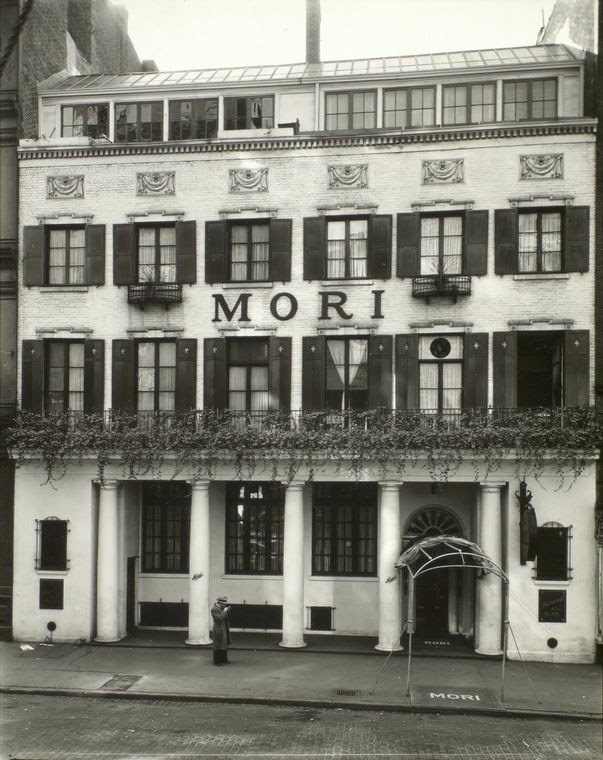 Mori's Restaurant in what was once part of Carroll Place (photo by Berenice Abbott). There's a Duane Reade in this space today. FOR SALE, a coloured WOMAN, aged 20 years; sober and honest; a good cook, and capable of all kinds of house-work. Enquire at this office. It is so easy to think that New York has always been a liberal, educated, progressive place--and then an ad like that pops up to remind us that this woman was being treated the same as a team of horses or a vacant lot on Bleecker Street. In 1817, the same year this advertisement ran, New York's governor, Daniel Tompkins, finally announced that he'd given the state legislature a ten-year timetable for abolition. The legislature, fearing they'd be voted out of office by slave-holding New Yorkers, took the full decade, declaring July 4, 1827, to be emancipation day in the state of New York. 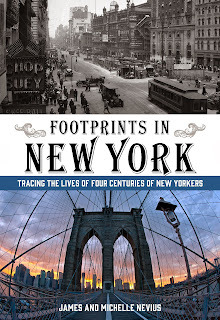 Yet, New York still thrived on the profits of slavery--so much so that when the Civil War started, Mayor Fernando Wood suggested the city secede from the Union so as to not lose its lucrative shipping contracts with southern planters. 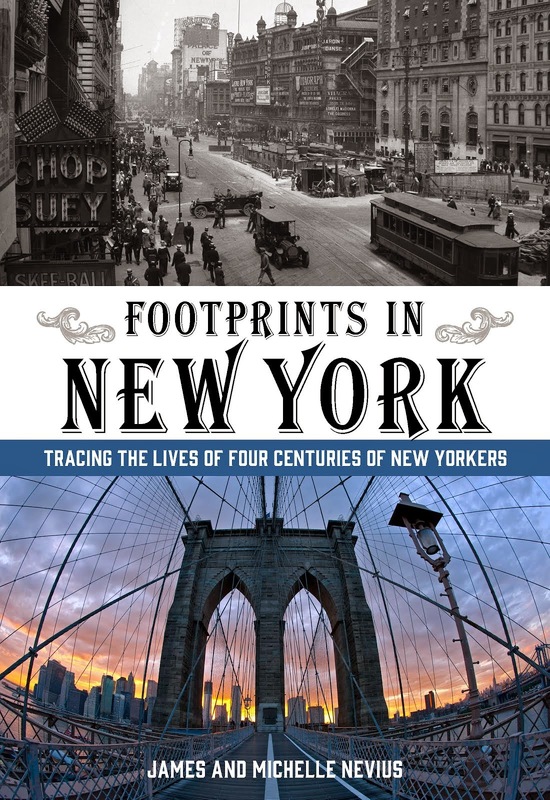 A few years ago, the New-York Historical Society hosted a landmark exhibition on the history of slavery in the city and they've kept their very informative website going a resource for students and anyone interested in this sad chapter in the city's history: http://www.slaveryinnewyork.org. 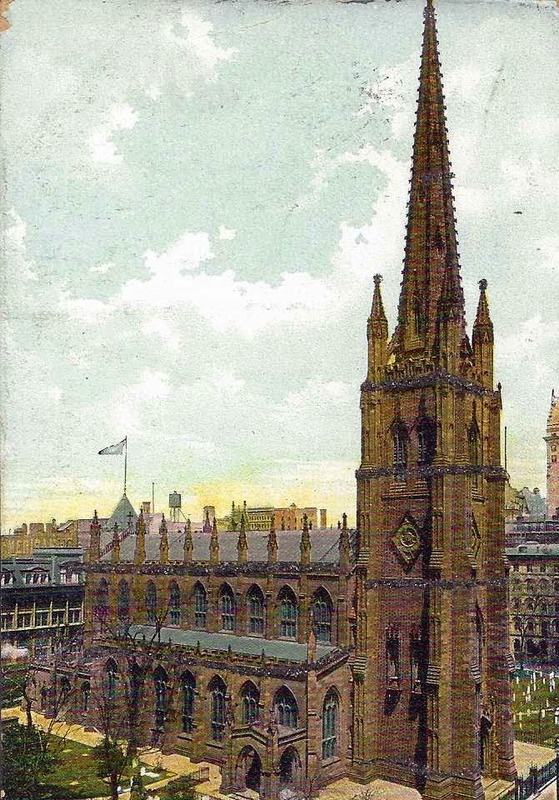 Today's postcard is a nice view of Trinity Church, Wall Street, and its surrounding churchyard, one of the oldest in New York City. The original Trinity had burned down on September 21, 1776, in the fire that swept through the city as Washington’s army retreated. A second church was consecrated in 1790, but a series of heavy snowstorms in the winter of 1838-39 so badly damaged the roof that the vestry voted to tear down the building and start again. The snows came at an opportune moment. 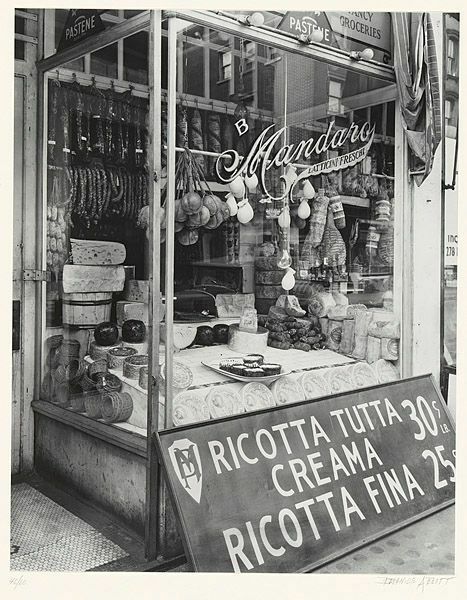 Already, neighborhoods like Greenwich Village had pulled prominent churchgoers northward.... Trinity needed to do something to return itself—in its own eyes, at least—to its rightful place as the city’s premiere religious institution. Richard Upjohn’s grand Gothic Revival building quickly restored Trinity to the forefront of the city’s social and architectural scene. 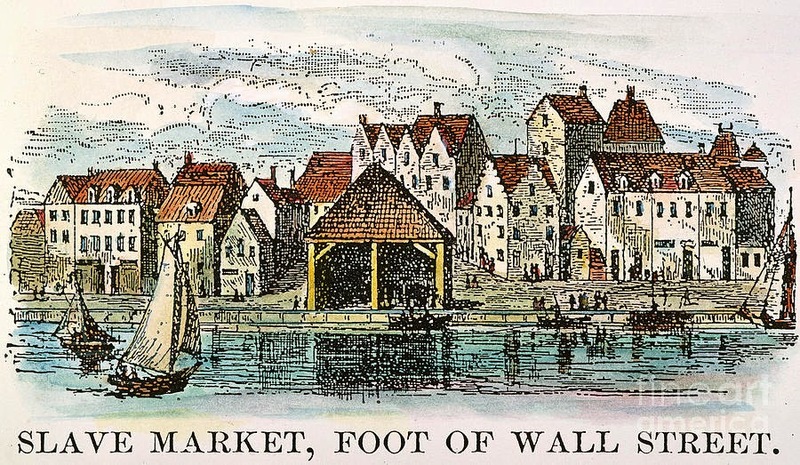 In 1844, architect Albert Gilman wrote of the almost-finished church: “[It] surpasses any church erected in England since the revival of the pointed style.” Its spire, at 281 feet tall, made it not only the tallest church in the city, but New York’s tallest building, a title it would retain for nearly 50 years. Part of what made the church so perfect was that Upjohn had copied it, almost exactly, from the design for “An Ideal Church” in the book True Principals by A.W. Pugin, the leading English proponent of the Gothic Revival. And unlike many of Upjohn’s successors and imitators, he had an attention to detail—overseeing everything from the stained glass to the exterior carvings—that gave Trinity an unequalled aesthetic appeal. The building was also controversial, however, both inside and out. A devout “high church” Anglo-Catholic, Upjohn introduced architectural elements that were utterly foreign to most Americans, including a chancel at the west end of the church complete with a high altar and rows of choir stalls. (At first, this was deemed too Roman Catholic, and the stalls weren’t used.) Outside, the building was constructed of brownstone, a locally quarried, soft sandstone. The stone was chosen for its outward resemblance to materials used in medieval English architecture, but not only did it lack the strength of schist, it was also commonly considered a cheap building material. 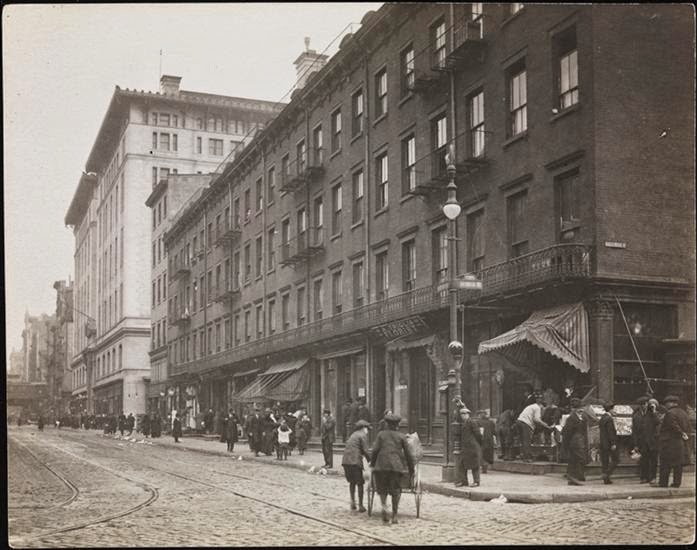 Though many people tend today to call all single-family townhouses in New York “brownstones,” in the 19th-century no one would have conflated cheaper brownstone buildings with their more expensive brick cousins. 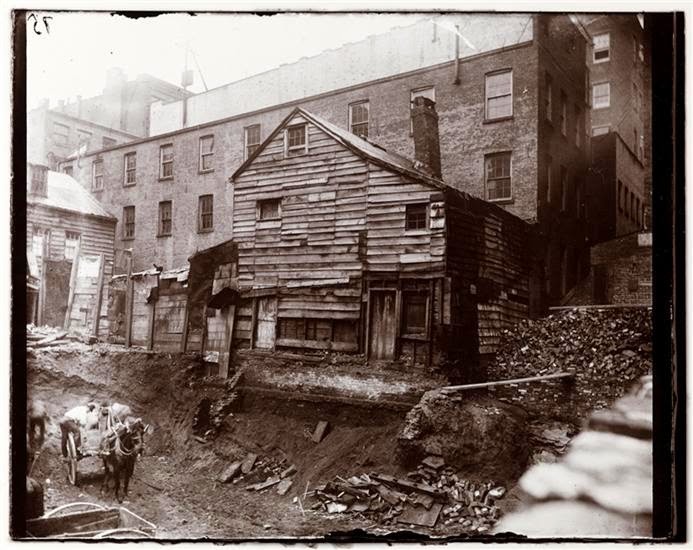 (In her autobiography, Edith Wharton deplored the look of New York, claiming it was bathed in a “universal chocolate-coloured coating of the most hideous stone ever quarried.”) Both at Trinity and at Ascension in Greenwich Village, Upjohn had to convince his employers that the look of brownstone outweighed its déclassé associations. 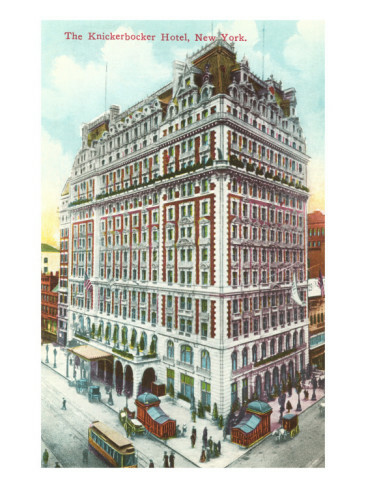 The former (and soon to be once again) Knickerbocker Hotel at Times Square is going to be one of the stops on our War & Peace in NYC walking tour this Sunday. On the day World War I ended, opera star Enrico Caruso came out on his balcony and serenaded the crowd with the national anthems of Italy, France, and the United States.